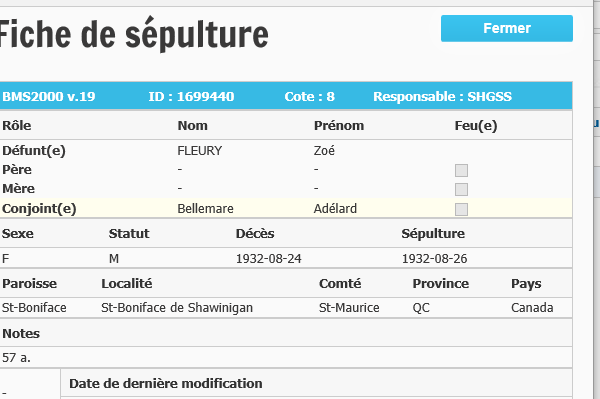 Je recherche le mariage d'Adelard Bellemare et Zoe-Rose Fleury. Leur fils Adelard est ne a Manchester St-Augustin en 1891 mais s'est marie a shawinigan en 1941..
ceui qui est ne en 1891 a St-augustin Manchester serait decede avant 1897..
1. LAURENT11 BELLEMARE (LOUIS10, JOSEPH-CHARLES9, ETIENNE-CHARLES8 GELINAS-BELLEMARE, CHARLES GELINAS DIT7 BELLEMARE, JEAN-BAPTISTE GELINAS6 DIT-BELLEMARE, JEAN GELINEAU DIT5 GELINAS, ESTIENNE4 GELLINEAU, CHARLES3, PIERRE-OLIVIER2, GUILLAUME1) was born 04 Apr 1835 in Louiseville,QC1. 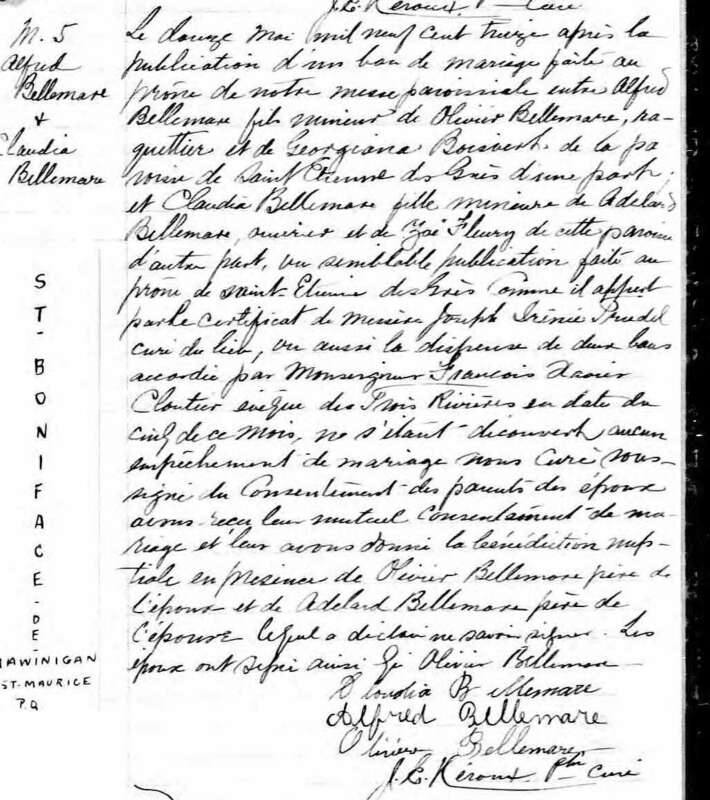 He married (1) OLIVINE BLAIS 10 Feb 1857 in Saint-Barnabe-Nord, QC. 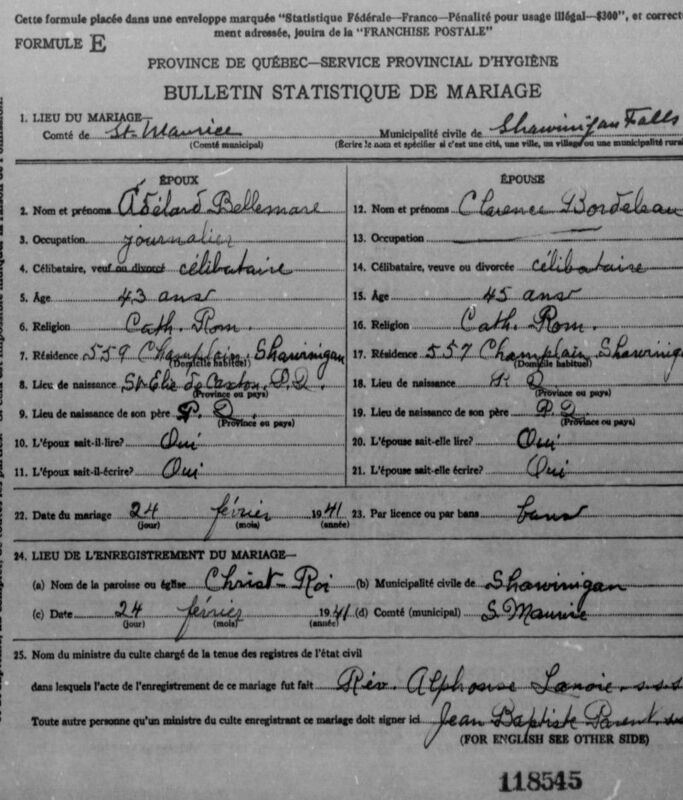 He married (2) EMILIE-EMELIE LEFEBVRE-BOULANGER 10 Aug 1858 in Riviere-du-Loup ( Louiseville), P.Q., daughter of CHARLES BOULANGER and JOSEPHTE CHAURETTE. Emilie boulanger, repertoire de St-Elie.. Aurelie/Eurelie in US. 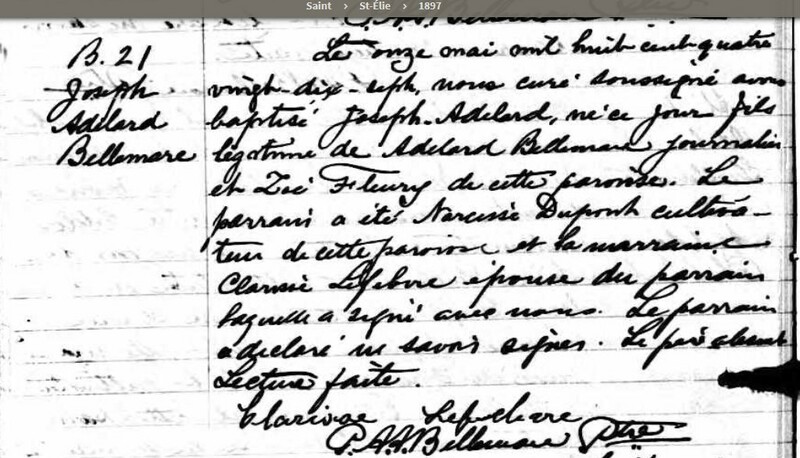 Marriage: 10 Aug 1858, Riviere-du-Loup ( Louiseville), P.Q. 2. ii. ANGELINA BELLEMARE, b. 1878; d. 07 Aug 1926, Shawinigan,St-Marc,QC. v. ELIZE-ELZIRE BELLEMARE, b. 05 Dec 1866, Saint-Severe,QC1; d. 25 Apr 1940, Manchester, Ste-Marie, NH, USA; m. CHARLES LESSARD, 15 Nov 1885, St-Augustin, Manchester, N.H. USA. vi. SEVERE BELLEMARE, b. 23 Jul 1859; d. 09 Jul 1932, Charette,Notre-Dame des Neiges,QC. vii. EMILIE BELLEMARE, b. 28 Jan 1861; d. 08 May 1861, Saint-Severe,QC1. agee de trois mois au deces. viii. MARIE-CELINA BELLEMARE, b. 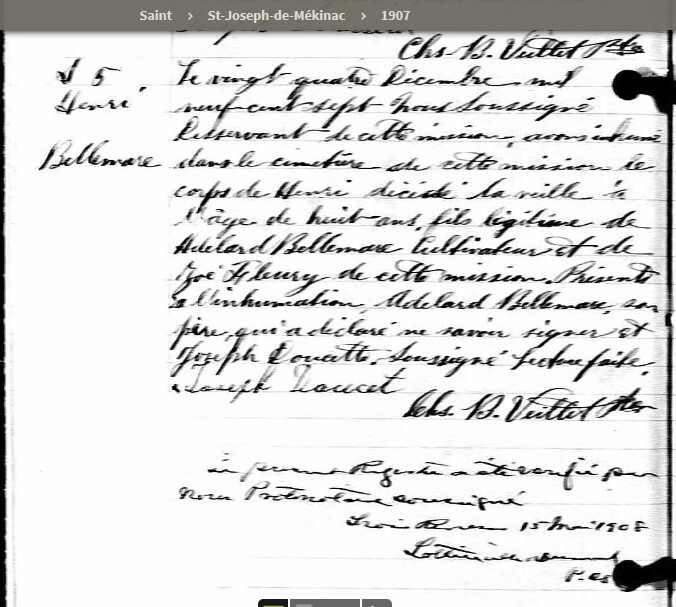 21 Sep 1862, Saint-Severe,QC1; d. 04 Feb 1863, Saint-Severe,QC1. 5. ix. HERCULE BELLEMARE, b. 08 Aug 1864; d. 13 Mar 1948.
x. ELISE BELLEMARE, b. 06 Dec 1866.
xi. CHARLES-GASPARD-ODILON BELLEMARE, b. 21 Jul 1869.
xii. MARIE-HERMINE BELLEMARE, b. 30 Aug 1871.
xiii. MARIE-IDA BELLEMARE, b. 14 Dec 1873.
xiv. MARIE-EMILIE BELLEMARE, b. 28 Feb 1879.
xv. EMMA-ELIZABETH BELLEMARE, b. 30 Apr 1880; m. JOSEPH BEAUREGARD, 03 May 1897, St-Augustin, Manchester, N.H. US. xvi. ISAIE-LAURENT BELLEMARE, b. 16 Sep 1886. 6. xvii. MARIE BELLEMARE, b. 19 Aug 1877, Saint-Severe,QC. 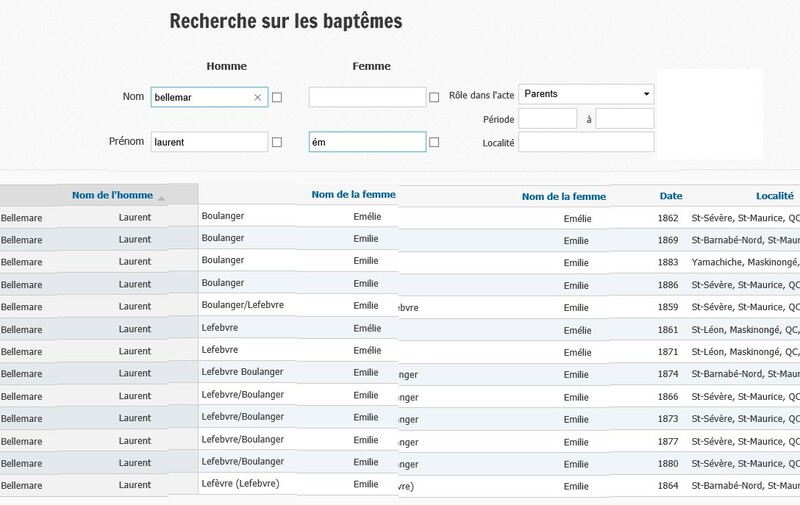 je n'ai aucun probleme avec fiston, ce sont les parents du pere que je cherche..
1. JEAN11 BELLEMARE (JEAN-BAPTISTE10, JOSEPH-CHARLES9, ETIENNE-CHARLES8 GELINAS-BELLEMARE, CHARLES GELINAS DIT7 BELLEMARE, JEAN-BAPTISTE GELINAS6 DIT-BELLEMARE, JEAN GELINEAU DIT5 GELINAS, ESTIENNE4 GELLINEAU, CHARLES3, PIERRE-OLIVIER2, GUILLAUME1) was born 21 Sep 1843 in Yamachiche,Qc. 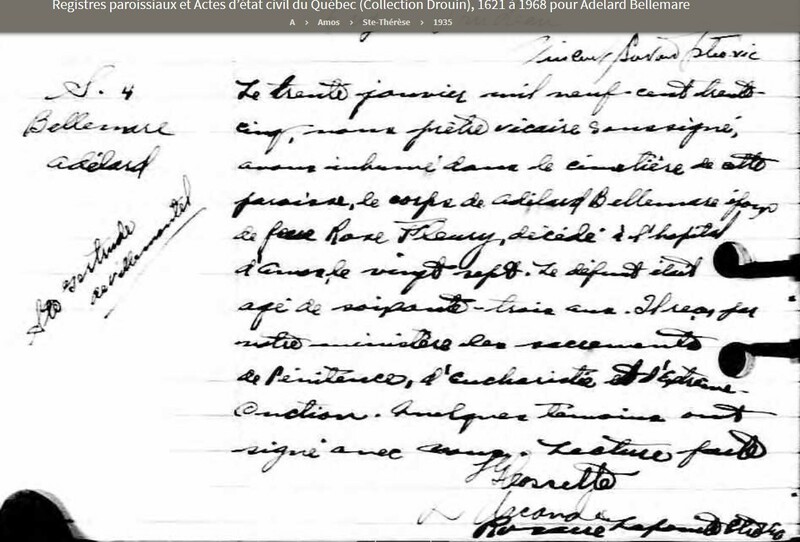 He married OLIVE DEZIEL 10 Oct 1865 in Saint-Severe,QC, daughter of LUC DEZIEL and ESTHER MATTEAU. 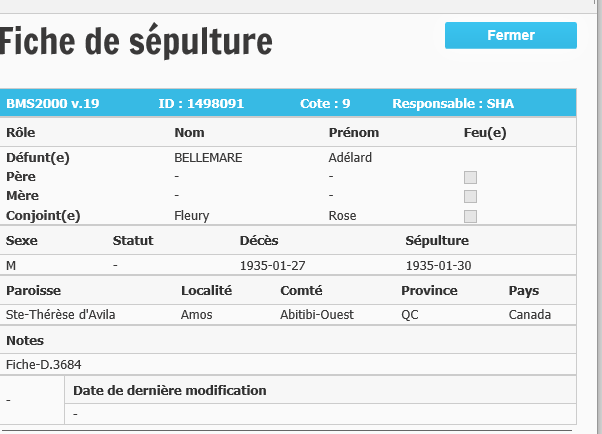 2. i. ADELARD12 BELLEMARE, b. 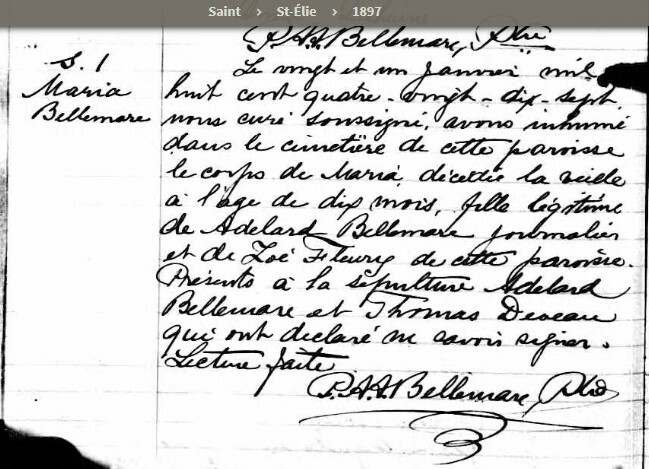 08 Apr 1871, Saint-Boniface de Shawinigan,Qc; d. 27 Jan 1935, Amos,Ste-Therese d'Avila,Qc. 2. ADELARD12 BELLEMARE (JEAN11, JEAN-BAPTISTE10, JOSEPH-CHARLES9, ETIENNE-CHARLES8 GELINAS-BELLEMARE, CHARLES GELINAS DIT7 BELLEMARE, JEAN-BAPTISTE GELINAS6 DIT-BELLEMARE, JEAN GELINEAU DIT5 GELINAS, ESTIENNE4 GELLINEAU, CHARLES3, PIERRE-OLIVIER2, GUILLAUME1) was born 08 Apr 1871 in Saint-Boniface de Shawinigan,Qc, and died 27 Jan 1935 in Amos,Ste-Therese d'Avila,Qc. He married ZOE-ROSE FLEURY. She was born 1875, and died 24 Aug 1932 in Saint-Boniface de Shawinigan,Qc. i. ADELARD13 BELLEMARE, b. 12 Apr 1891, Manchester,St-Augustin,N.H.USA. 3. ii. MARIE-LOUISE-CLAUDIA BELLEMARE, b. 28 Jul 1893, Manchester,St-Augustin, N.H.,USA; d. 11 Mar 1940, Shawinigan,St-Marc,QC. iii. MARIA BELLEMARE, b. 26 Sep 1895, Manchester,St-Augustin,N.H.USA. iv. ADELARD BELLEMARE, b. 11 May 1897, St-Elie de Caxton,Qc; d. 25 Jan 1974, Trois-Rivieres,Qc; m. CLARENCE BORDELEAU, 24 Feb 1941, Shawinigan,Christ-Roi,,Qc. v. JOSEPH-LOUIS-HENRI BELLEMARE, b. 05 Mar 1899, St-Elie de Caxton,Qc. 3. MARIE-LOUISE-CLAUDIA13 BELLEMARE (ADELARD12, JEAN11, JEAN-BAPTISTE10, JOSEPH-CHARLES9, ETIENNE-CHARLES8 GELINAS-BELLEMARE, CHARLES GELINAS DIT7 BELLEMARE, JEAN-BAPTISTE GELINAS6 DIT-BELLEMARE, JEAN GELINEAU DIT5 GELINAS, ESTIENNE4 GELLINEAU, CHARLES3, PIERRE-OLIVIER2, GUILLAUME1) was born 28 Jul 1893 in Manchester,St-Augustin, N.H.,USA, and died 11 Mar 1940 in Shawinigan,St-Marc,QC. She married ALFRED BELLEMARE 12 May 1913 in Saint-Boniface, Shawinigan, Qc, son of OLIVIER BELLEMARE and GEORGIANA BOISVERT. i. EDIANNETTE14 BELLEMARE, m. FREDERIC GARCEAU, 13 May 1939, Shawinigan,Christ-Roi,QC. ii. MARIE-ANTONIA-YVETTE BELLEMARE, b. 16 Jan 1924, Saint-Etienne des Gres,Qc. vi. LEO-PAUL BELLEMARE, m. MARIE-CLAIRE MORIN, 01 Sep 1969, Shawinigan,Christ-Roi,QC. vii. THERESE BELLEMARE, b. 1926; d. 28 Oct 1932, Shawinigan,St-Pierre,QC. viii. ANONYME BELLEMARE, b. 21 Oct 1932, Shawinigan,St-Pierre,Qc; d. 21 Oct 1932, Shawinigan,St-Pierre,Qc. 7. ix. EDITH BELLEMARE, d. 12 Feb 1999, Shawinigan,St-Marc,Qc. 4. GERARD14 BELLEMARE (MARIE-LOUISE-CLAUDIA13, ADELARD12, JEAN11, JEAN-BAPTISTE10, JOSEPH-CHARLES9, ETIENNE-CHARLES8 GELINAS-BELLEMARE, CHARLES GELINAS DIT7 BELLEMARE, JEAN-BAPTISTE GELINAS6 DIT-BELLEMARE, JEAN GELINEAU DIT5 GELINAS, ESTIENNE4 GELLINEAU, CHARLES3, PIERRE-OLIVIER2, GUILLAUME1) He married LUCIENNE THIBEAULT 18 May 1936 in Shawinigan,Notre-Dame de la Presentation,Qc. i. JULIENNE-MARIE-SUZANNE15 BELLEMARE, b. 06 Jul 1938, Shawinigan,St-Marc,Qc. 5. HENRI14 BELLEMARE (MARIE-LOUISE-CLAUDIA13, ADELARD12, JEAN11, JEAN-BAPTISTE10, JOSEPH-CHARLES9, ETIENNE-CHARLES8 GELINAS-BELLEMARE, CHARLES GELINAS DIT7 BELLEMARE, JEAN-BAPTISTE GELINAS6 DIT-BELLEMARE, JEAN GELINEAU DIT5 GELINAS, ESTIENNE4 GELLINEAU, CHARLES3, PIERRE-OLIVIER2, GUILLAUME1) He married THERESE THIBEAULT 29 Oct 1939 in Shawinigan,Notre-Dame de la Presentation,Qc. i. NOEL-JEAN-GUY15 BELLEMARE, b. 26 Dec 1937, Shawinigan,St-Marc,Qc; m. LOUISELLE DYON, 20 Feb 1960, Shawinigan,St-Pierre,QC. ii. MONIQUE BELLEMARE, m. ONIL TURCOTTE, 26 Dec 1956, Shawinigan,Christ-Roi,QC; d. Bef. 2015.
iii. JOSEPH-HENRI-RAYMOND BELLEMARE, b. 16 Sep 1936, Shawinigan,St-Marc,Qc; d. 20 Jan 1937, Shawinigan,St-Marc,QC. iv. JOSEPH-YVON-JACQUES BELLEMARE, b. 12 Mar 1939, Shawinigan,St-Marc,Qc. 6. MARCEL14 BELLEMARE (MARIE-LOUISE-CLAUDIA13, ADELARD12, JEAN11, JEAN-BAPTISTE10, JOSEPH-CHARLES9, ETIENNE-CHARLES8 GELINAS-BELLEMARE, CHARLES GELINAS DIT7 BELLEMARE, JEAN-BAPTISTE GELINAS6 DIT-BELLEMARE, JEAN GELINEAU DIT5 GELINAS, ESTIENNE4 GELLINEAU, CHARLES3, PIERRE-OLIVIER2, GUILLAUME1) He married ANTOINETTE MORIN 11 Nov 1944 in St-Paul l'Ermite, Legardeur,Qc. i. DENIS15 BELLEMARE, m. (1) FRANCE LAGACE; m. (2) CELINE BELAND, 11 Nov 1965, Shawinigan,St-Pierre,QC. 8. ii. ANDRE BELLEMARE, b. 1956; d. 05 Aug 2000, Victoriaville,QC. iii. FERNAND BELLEMARE, m. (1) NICOLE DUPUIS; m. (2) NICOLE BEAUPRE, 22 Aug 1970, Shawinigan,L'Assomption,QC. iv. GILLES BELLEMARE, m. FRANCINE BOISVERT, 14 Jul 1973, Shawinigan,St-Mrc,QC. v. REJEAN BELLEMARE, m. GINETTE ROBITAILLE. 7. EDITH14 BELLEMARE (MARIE-LOUISE-CLAUDIA13, ADELARD12, JEAN11, JEAN-BAPTISTE10, JOSEPH-CHARLES9, ETIENNE-CHARLES8 GELINAS-BELLEMARE, CHARLES GELINAS DIT7 BELLEMARE, JEAN-BAPTISTE GELINAS6 DIT-BELLEMARE, JEAN GELINEAU DIT5 GELINAS, ESTIENNE4 GELLINEAU, CHARLES3, PIERRE-OLIVIER2, GUILLAUME1) died 12 Feb 1999 in Shawinigan,St-Marc,Qc. She married PAUL BOISVERT 30 Aug 1947 in Shawinigan,St-Marc,QC. 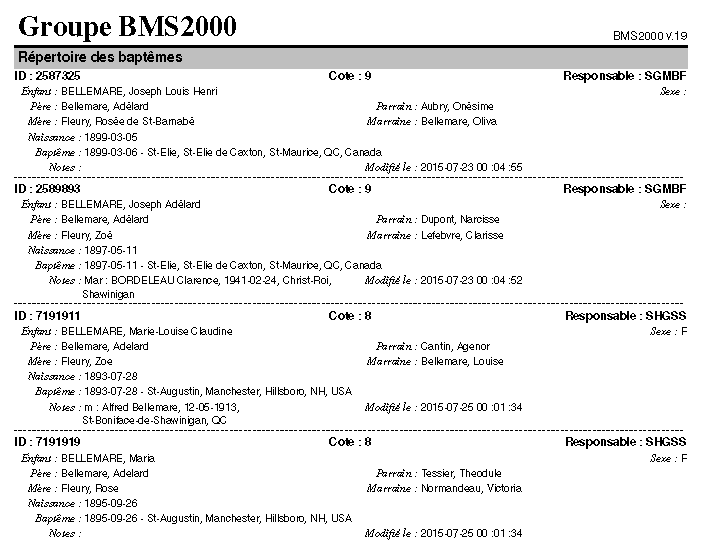 i. FRANCINE15 BOISVERT, m. (1) GILLES LAVOIE; m. (2) GILLES BELLEMARE, 14 Jul 1973, Shawinigan,St-Mrc,QC. ii. COLETTE BOISVERT, m. MARIO ISABELLE. iii. GUY BOISVERT, m. DANIELLE PERREAULT. iv. RENE BOISVERT, m. DANIELLE BEDARD. v. NORMAND BOISVERT, m. GUYLAINE COUTURE. vi. LUCIE BOISVERT, m. GUY LANGLOIS. 8. ANDRE15 BELLEMARE (MARCEL14, MARIE-LOUISE-CLAUDIA13, ADELARD12, JEAN11, JEAN-BAPTISTE10, JOSEPH-CHARLES9, ETIENNE-CHARLES8 GELINAS-BELLEMARE, CHARLES GELINAS DIT7 BELLEMARE, JEAN-BAPTISTE GELINAS6 DIT-BELLEMARE, JEAN GELINEAU DIT5 GELINAS, ESTIENNE4 GELLINEAU, CHARLES3, PIERRE-OLIVIER2, GUILLAUME1) was born 1956, and died 05 Aug 2000 in Victoriaville,QC. He married (1) JOCELYNE PAQUET 04 May 1974 in Quebec,St-Joseph,QC, daughter of ALPHONSE PAQUET and CECILE DUVAL. He married (2) NOELLA MICHAUD 31 Aug 1979 in quebec,civil,QC, daughter of ALEXANDRE MICHAUD and MARIE-JEANNE CHOUINARD. 1. JEAN-LEON11 BELLEMARE (JEAN-BAPTISTE10, JOSEPH-CHARLES9, ETIENNE-CHARLES8 GELINAS-BELLEMARE, CHARLES GELINAS DIT7 BELLEMARE, JEAN-BAPTISTE GELINAS6 DIT-BELLEMARE, JEAN GELINEAU DIT5 GELINAS, ESTIENNE4 GELLINEAU, CHARLES3, PIERRE-OLIVIER2, GUILLAUME1) was born 21 Sep 1843 in Saint-Severe, QC, and died 01 Jun 1915 in Saint-Boniface de Shawinigan,Qc. He married (1) MARIE-OLIVA DEZIEL-LABRECHE 10 Oct 1865 in Saint-Severe, Qc, daughter of LUC DEZIEL and ESTHER MATTEAU. She was born 29 Oct 1849 in Yamachiche,Qc, and died 07 Oct 1875 in St-Elie de Caxton,Qc. He married (2) PHILOMENE DESCOTEAUX-LEFEBVRE 28 Feb 1876 in St-Elie de Caxton,Qc. He married (3) ZELIA-JULIA GELINAS 31 Jan 1887 in Saint-Severe, Qc, daughter of THADDEE GELINAS and EMILIE GIRARD. She was born 24 Jan 1855 in Saint-Barnabe-Nord, QC, and died 03 Jan 1888 in Saint-Elie de Caxton, Qc. He married (4) ANAPHLETE LAMY 09 Feb 1891.
i. OLEDA12 BELLEMARE, b. 1867; d. 1942, Watertown,CT; m. JOSEPH LAMPRON, 09 Nov 1886, St-Elie de Caxton,Qc. ii. ANGELINA-JOSEPHINE BELLEMARE, b. 22 Jan 1873.
iii. MARIE-MEZELIE BELLEMARE, b. 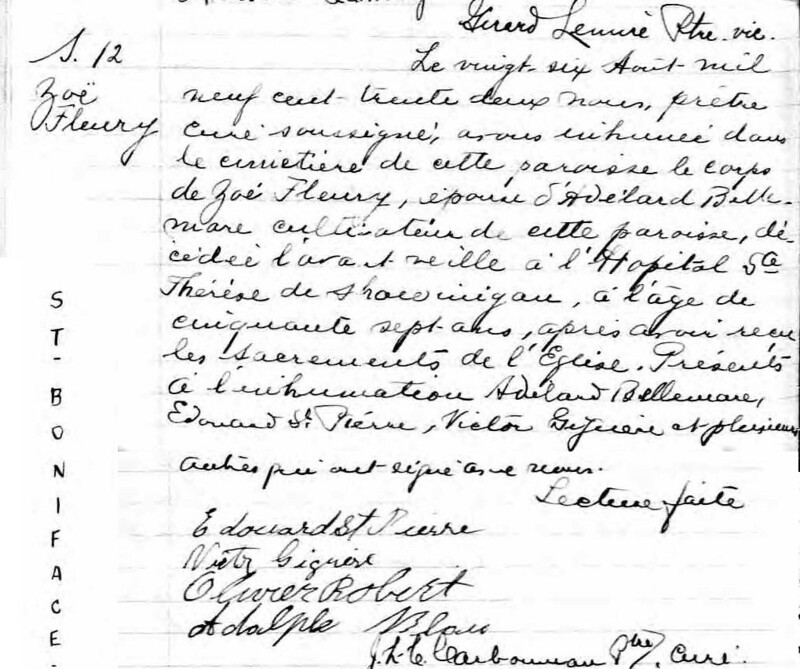 16 Sep 1874; m. PIERRE-ISAAC DUBE, 23 Sep 1890, Saint-Severe,QC; b. 05 Jan 1870, Saint-Barnabe-Nord,Qc. iv. ADELARD BELLEMARE, b. 08 Apr 1871, Saint-Boniface de Shawinigan,Qc; d. 27 Jan 1935, Amos,Ste-Therese d'Avila,Qc; m. ZOE-ROSE FLEURY; b. 21 Aug 1875; d. 24 Aug 1932, Saint-Boniface de Shawinigan,Qc. v. EVA12 BELLEMARE, b. 19 Sep 1887.